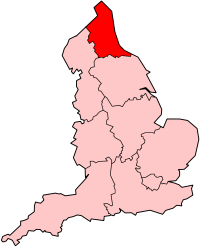 North East England is a constituency of the European Parliament. It currently elects 3 MEPs using the d'Hondt method of party-list proportional representation. ✪ Rory Stewart OBE: "Failed States - and How Not to Fix Them"
The constituency corresponds to the North East England region of the United Kingdom, comprising the ceremonial counties of Northumberland, Tyne and Wear, County Durham and parts of North Yorkshire. The constituency was formed as a result of the European Parliamentary Elections Act 1999, replacing a number of single-member constituencies. These were Durham, Northumbria, Tyne and Wear, and parts of Cleveland and Richmond. ^ "european elections 10-13 june". Europarl.europa.eu. 10 June 2004. Retrieved 31 January 2016. ^ "MEPs by Member State and political group, 8th parliamentary term". European Parliament. Retrieved 16 January 2019. ^ a b c d e f g h Smith, Dave (24 April 2014). "Statement of Persons Nominated" (PDF). City of Sunderland. Archived from the original (PDF) on 3 May 2014. Retrieved 3 May 2014. ^ "Full Tory MEP Candidate Rankings | Guido Fawkes". Order-order.com. 31 July 2013. Retrieved 31 January 2016. ^ "European selection results – complete". Libdemvoice.org. 1 December 2012. Retrieved 31 January 2016. ^ "North East Euro Election Fundraiser | National News | British National Party". Bnp.org.uk. Archived from the original on 8 February 2016. Retrieved 31 January 2016. ^ "English Democrats 2014 EU Elections – 60 Candidates List (100% Coverage of England) | Steve Uncles - English Democrats". Steveunclesenglishdemocrats.org. Archived from the original on 11 January 2016. Retrieved 31 January 2016. ^ "2009 election results". BBC News. 19 April 2009. Retrieved 7 June 2009. ^ "Labour's 2009 EP candidates – Jon Worth". Jonworth.eu. 22 January 2016. Retrieved 31 January 2016. ^ 4. Richard Lawson (4 June 2009). "2009 European Elections". Greenparty.org.uk. Retrieved 31 January 2016. ^ "Carbase". Juryteam.org. Archived from the original on 20 February 2012. Retrieved 31 January 2016. ^ "2004 Election candidates". UK Office of the European Parliament. Archived from the original on 4 October 2009. Retrieved 4 June 2009. ^ "necand". Web.archive.org. 3 June 2004. Archived from the original on 3 June 2004. Retrieved 31 January 2016. ^ "1999 Election candidates". UK Office of the European Parliament. Archived from the original on 28 August 2009. Retrieved 4 June 2009. ^ "BNP under the skin: Colin Smith". BBC News. Retrieved 20 May 2010.